As posted earlier – Journal ranking – 2012 JCR – the ISI Web of Knowledge (Web of Science) Journal Citation Reports for 2012 are now available. From Google Scholar Metrics post on INSEAD’s Academic Trends and Innovation blog. The 2013 version of Google Scholar Metrics was released on July 24, 2013. It covers articles published between 2008 and 2012. 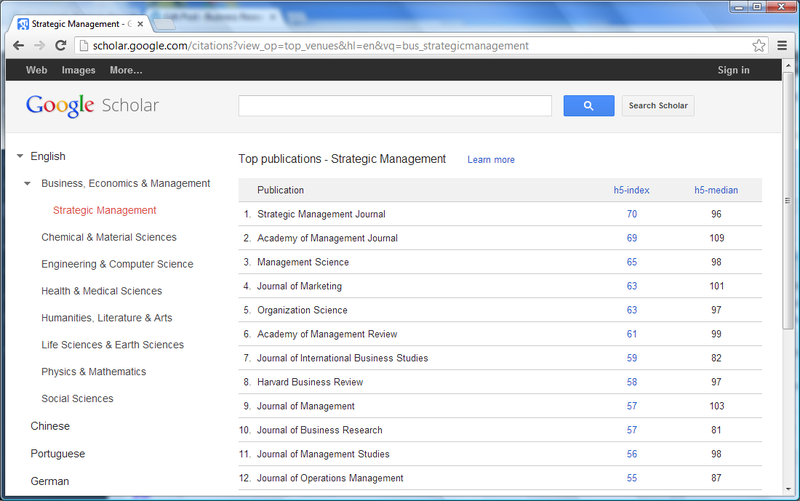 The SJR SCImago Journal and Country Rank – Journal Ranking, based on Scopus data, still have 2011 as their latest year. The CWTS Journal Indicators are also based on Scopus data, and again 2011 is the latest available. Google scholar is a useful resource for finding books and articles. On campus PCs are configured so that it provides Find It via UML links. Off campus you can configure Google scholar to include these links. Click the Save Preferences button at the foot of the page. The Find It via UML links do not give you direct access to online articles. You still need to authenticate yourself as a member of the University to access the full text. How can I check a journal’s availability through the library? For those interested in the details, adding the library preference to Google scholar means that it checks the library’s “link resolver” for items in the search results and adds a link where appropriate. Mouzas, S., Henneberg, S., and Naude, P. (2007) Trust and reliance in business relationships. European Journal of Marketing, 41 (9-10), 1016-1032. Web of Knowledge (Web of Science) shows that this article has been cited by 12 articles that are themselves covered by Web of Science. 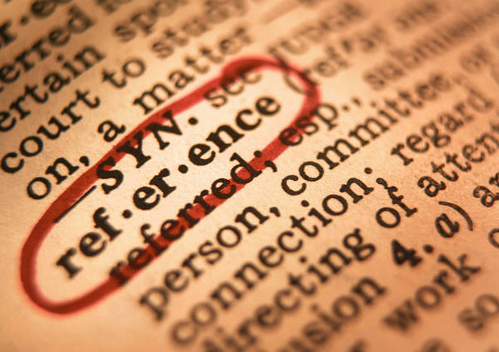 It also offers the chance to look for related articles – those that are similar to this one because of the references they share. Note: Web of Knowledge does not give direct access to full-text but these are mostly easily reachable through the purple FindIt@UML links. Scopus shows that this article has been cited by 17 articles that are covered by Scopus. The details are in the Cited by since 1996 section on the right hand side. 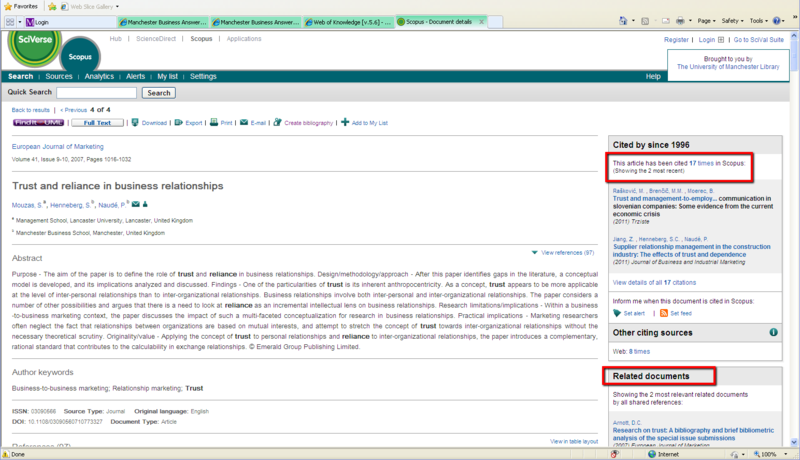 Like Web of Knowledge, Scopus also offers links to related documents based on the references they share and access to full text through the purple FindIt@UML links. Both databases also offer the chance to setup an alert when a particular article is cited by another in the database. Google scholar will give an even greater number of cited by resources – 39 for this example. This is because Google scholar will include everything where it can find the full text or bibliometric information on the web – articles, books, conference papers, working papers, reports, theses. In contrast Web of Knowledge and Scopus only include cited by from respected academic publications that qualify for inclusion in the respective database. Finally I must acknowledge Dave Hirst’s post on the Everything Engineering blog that partly inspired this one – How to track the citations? Web of Science versus Google Scholar. 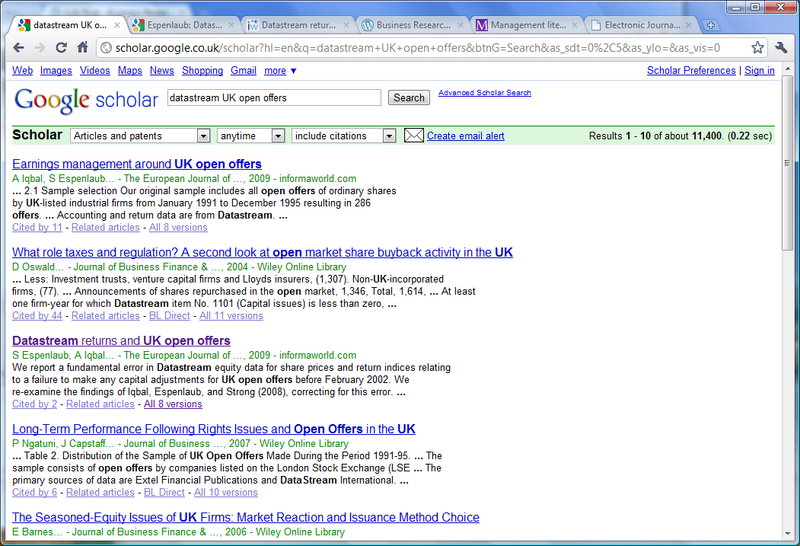 Google Scholar is a quick and effective way of finding articles when doing a literature search. Getting to the full-text of the article can require a little work. Does the University of Manchester library offer access to the full-text? informaworld.com – informaword (Taylor and Francis Group) will give you access to full-text. 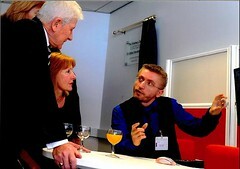 You need to either be recognised as using a University of Manchester PC or logon to authenticate youself. There is not really an easy way of knowing which is the best link offered by Google Scholar to choose. 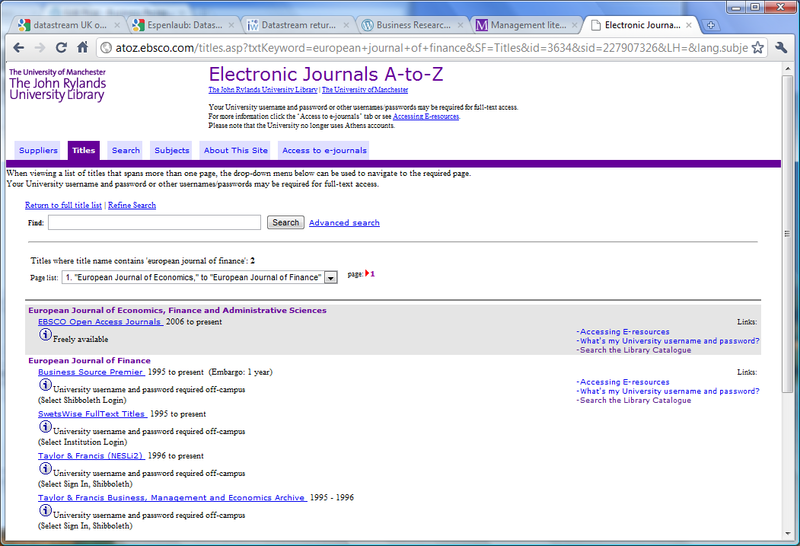 Using the journal title, The European Journal of Finance in this case, you can use the A-Z e-journal list to find details of the library’s subscription(s). An alternative for academic journal articles is to try one of the bibliographic databases: ISI Web of Science (Web of Knowledge) or Scopus. 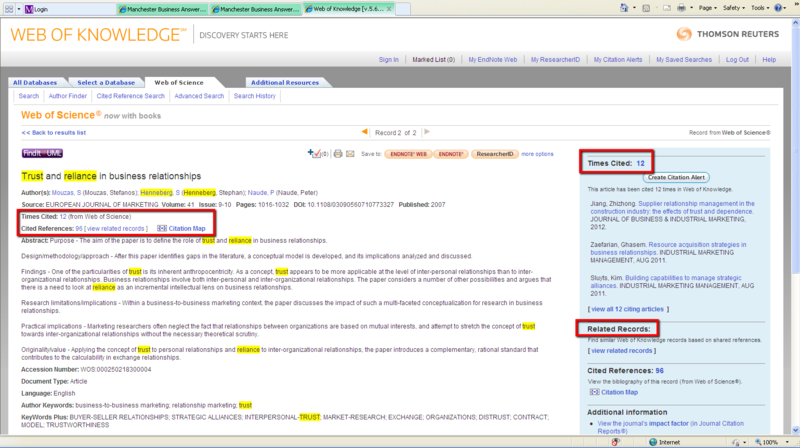 Both of these include FindIt at JRUL links to help locate the full-text of articles. Google scholar is a useful resource for finding books and articles. On campus PCs are configured so that it provides Find It via JRUL links. Off campus you can configure Google scholar to include these links. The Find It via JRUL links are not perfect. If the link does not give you access to the article then you should double-check whether the journal is available as an e-journal.